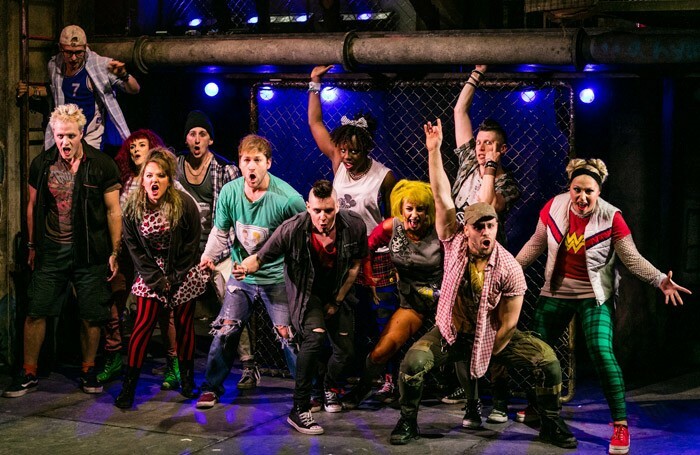 This British production of the all-American rock musical American Idiot premiered at the appropriately grungy Arts Theatre in London last year, after a previous US touring edition travelled to the UK in 2012. Now it, too, embarks on a UK tour; watching it in the Churchill Theatre in Bromley creates a far greater sense of spiritual unease and this works in favour of the show, which is a jolt in the arm of suburban complacency. American Idiot is a tale of late adolescent angst, even rage and sometimes bleached-out drugged despair in its youthful nihilism; it’s not meant to be comfort food, like so many jukebox shows, but a real cry of driving rock emotion. And on that score, Racky Plews’ production, musically directed by Robert Wicks, is suitably loud – though sometimes indistinct thanks to an overworked sound system – but also too often ragged and dramatically incoherent. There’s a lot of blinding light and over-repetitive movement, that turns it into something of an undifferentiated mess. Yet Green Day’s blazing rock anthems are still among the best of the last two decades; the result is like a contemporary update to Hair by way of Rent, and a punchy, vibrant young company giving it their all. At the performance reviewed, which was heavy with covers, Matt Thorpe as Johnny, Cellen Chugg Jones as Tunny, and Lawrence Libor as Theo are raw and jagged; there was also a strident pop presence from Alice Stokoe as Whatsername, standing in for Amelia Lily.